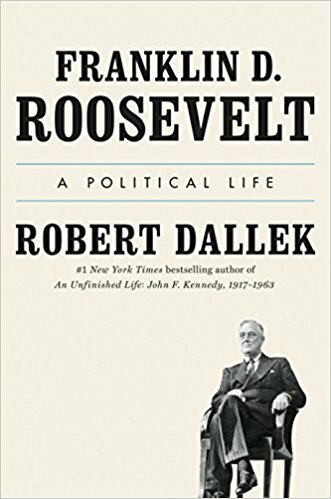 Franklin D. Roosevelt: A Political Life by Robert Dallek opens a window into the President’s mind and psychological profile of this ambitious man who used his family name and privilege to its best advantage. There are many good biographies of FDR, but none portray him as much as a political operative and opportunist than this one. For those who want to know how Franklin D. Roosevelt developed his social agenda to create opportunity for those in need, you might walk away from this book with a feeling that FDR had no core beliefs and no passion for changing America. His passion was to become the President of the United States. It’s not surprising that the book is already near the top of FDR biographies. Author Robert Dallek is known for his presidential biographies. His prior books include Camelot’s Court, An Unfinished Life, and Nixon and Kissinger. A fellow of the American Academy of Arts and Sciences and of the Society of American Historians, Dallek’s writing has also appeared in the The New York Times, The Washington Post, The Atlantic, and Vanity Fair. First, unlike any other president, he understood that effectiveness in the American political system depended on building a national consensus and commanding stable long-term popular support. Second, he made the presidency the central, most influential institution in modern America’s political system. In addressing the country’s international and domestic problems, Roosevelt recognized the vital importance of remaining closely attentive to the full range of public sentiment around policy-making decisions—perhaps FDR’s most enduring lesson in effective leadership. Overall, the biography offers a frank and balanced look at what made FDR tick. It discusses FDR’s uncanny ability to read public sentiment and use it to unite the country. However, it doesn’t gloss over the more unflattering aspects of his personality and politics, such as his attitudes as a privileged “undemocratic snob” who used “the influence of men he considered unworthy of public influence…” Dallek also highlights that FDR often made debatable decisions in the name of furthering his agenda. In addition to providing an in-depth historical examination of FDR’s greatest political challenges and victories, Franklin D. Roosevelt: A Political Life is extremely well-written. While the 700-page biography is fact-driven and authoritative, the narrative is entertaining and easy to read. The critics agree; the book was named a Best Book of the Year by both The Washington Post and NPR. It is available at Amazon.com in hard cover, paperback and Kindle additions.